Do you want to present visual messages in new ways? Are you looking for new design tools to help you create visual content? Social media is nothing without images. From simple blog graphics to memes and videos, visuals help us communicate with and engage our audiences. In this article I’ll show you eight design resources and tools that can help you create visual content quickly and easily. 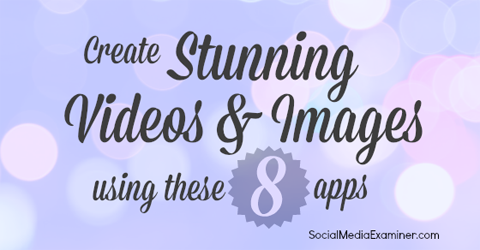 Find 8 apps to create stunning social media images. If you’re looking for photos to use in your images, I have two resources for you: Unsplash and New Old Stock. Unsplash is a free photo archive that prides itself on offering “do-whatever-you-want, hi-res images.” According to their licensing information, the images on the site are not copyrighted, which means you have free rein over how you use them. Use copyright-free images as a backdrop for your primary message. Unsplash’s subscription service gives you 10 new images delivered straight to your inbox every 10 days. It’s not always easy to find what you’re looking for on Unsplash. You can view images by month of submission, but there is no way to browse by topic or any other category. 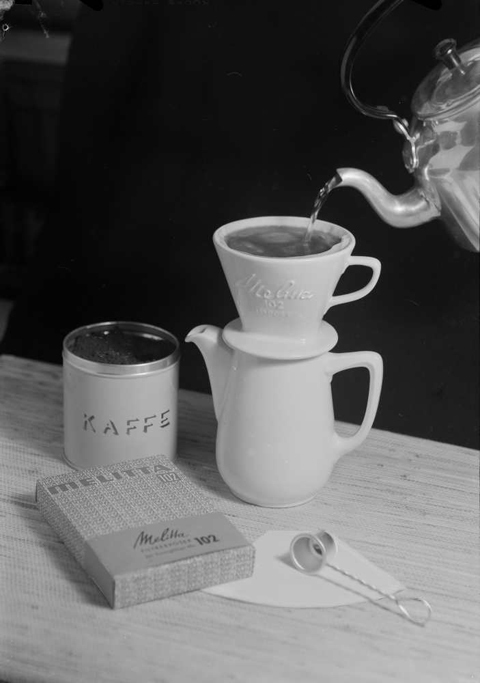 New Old Stock provides “vintage photos from the public archives” and promises that no known copyright restrictions exist on them. You can find photos from times past at New Old Stock. 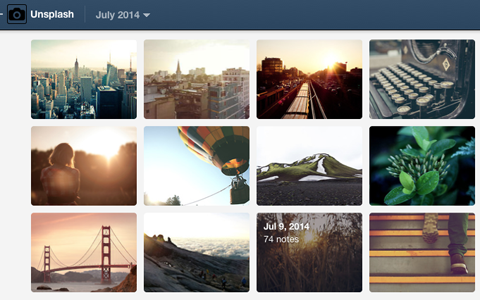 Like Unsplash, you can’t browse images by theme, topic or any other categories. Nonetheless, New Old Stock features some incredible vintage photography. If that’s what you’re looking for, this is the place. Video has taken content marketing by storm—audiences love it. If you’ve shied away from video because it’s too time-consuming or expensive, you should probably take a look at PowToon. PowToon is a super-simple app that helps you create animated videos that will truly engage your audience. 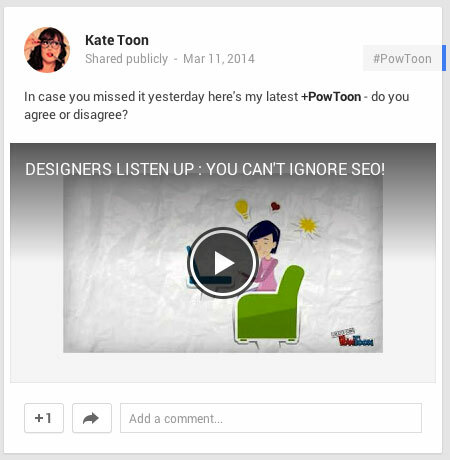 Use PowToon to create videos and presentations with a big “Wow!” factor. PowToon features many templates and a well-stocked library of shapes, objects and effects you can use in your animation. If you’ve ever thought about creating product overviews, presentations or even instructional videos, you can use PowToon for those and more. Whatever your message, an attractive video can probably enhance it. 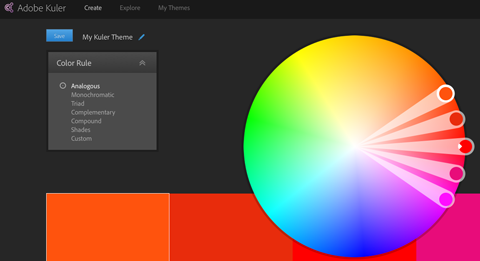 Adobe Kuler is a service that lets you create your own color palette or choose from thousands of existing ones. Why is that important? Colors affect our perception, our emotions and our behavior. We associate colors with different concepts and respond to them in various ways. Use Kuler to find just the right color for your message. With Kuler, you can find the right color balance for your visual content. Once you find your perfect palette, grab the code for each color (RGB, HEX, LAB, CMYK, HSB). You can type the code into just about any design tool to make sure your color is always exactly right. Canva is a true delight for any content marketer. You can use this free tool to create a multitude of different images for web and print—blog graphics, buttons, social media images and business cards are just a few of your options. Canva is an easy way to create good-looking graphics quickly. Your first visit to Canva may take a while as you explore its features and test out all of the banners, images and fonts. The interface is intuitive and with a little training, you’ll be creating graphics in no time. 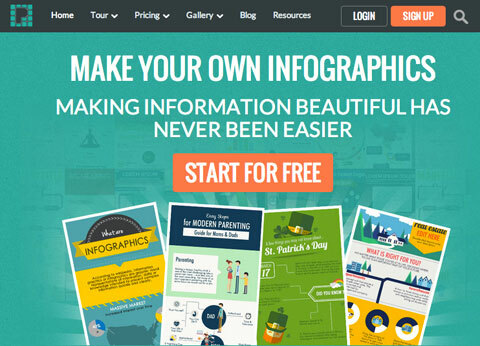 If you’re looking to create an infographic, Piktochart is one tool you can’t ignore. It features a set of themes and templates you can use as the base of your infographic—all you have to do is add your data and text. 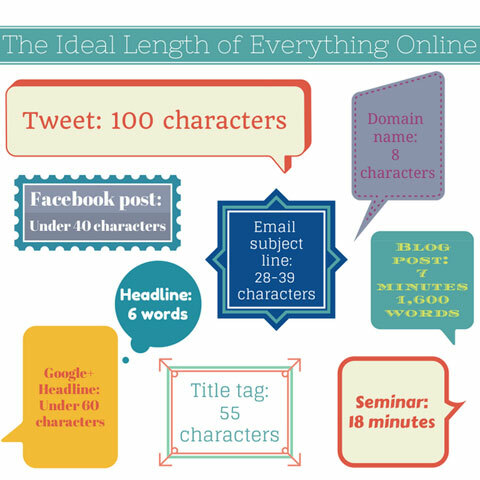 Building infographics doesn’t have to be overwhelming. You can edit each theme to your liking, and once you’re done you can share your infographic across social media and/or embed it on your website. It’s that simple. Sometimes the best way to emphasize your point is to use images to back up your words. In these cases Awesome Screenshot is priceless. Most screenshot tools take the shot and if you want to add anything else, you have to open it in another application to make changes. Awesome Screenshot is different because it lets you add graphic elements right in the tool. Whether you’re giving a presentation or writing a blog post, adding screenshots with arrows, circles and other shapes can clarify your point and have a larger impact on your audience. However, I have to tell you that this tool is a browser extension and only takes pictures of whatever is in your browser window. Call me silly, but I love quotes. They almost always inspire or affect me in some way, and I’m not alone. Quotes are a great idea for viral content, especially on social networking sites like Pinterest. But for quotes to catch on, they need to look intriguing. That’s where QuotesCover comes in. This tool helps you turn words of wisdom into awesome looking e-cards, social media profile images and even prints. Quotes usually strike a chord with audiences and are very shareable. When you want to inspire your audience with a powerful statement, this tool can prove invaluable. 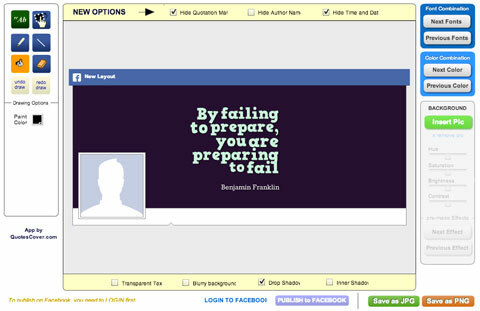 QuotesCover offers good-looking fonts and also lets you add drawings and modify your finished design. If you have a website, app or other online product, I think you’re going to like Placeit. The app allows you place your own video or picture in a template so you can show others how your product or image will look on different devices. 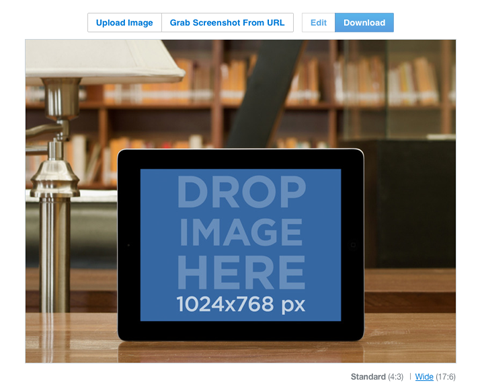 Show users how your product will look on their device. Placeit has a number of options—you can find photos of people using different devices while they are at home, in a corporate meeting, on vacation and so on. Placeit is free to use, but it adds a watermark to each photo. If you don’t want the watermark, you’ll have to pay $8 per photo. If you’re going to spend time creating visual content, it makes sense to choose tools that make your job easier. 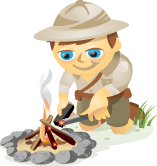 The resources in this article offer options for just about every marketing need you’ll come up with. Plus, they’re easy to learn and use to produce quality images. What do you think? Have you used any of these tools? How do you create your own visual content? Let us know in the comments. Olga Andrienko is the Director of Social Media at SEMrush. Olga specialises in conversion and relationship marketing and has increased SEMrush revenue from social media 10 fold in one year.